 Economic soft patch. Since the start of the year, consensus forecasts for first quarter gross domestic product (GDP) growth have fallen to 1.5% from 2.3%, based on Bloomberg consensus forecasts. Ongoing trade uncertainty, slower growth overseas — particularly in Europe — and the record-long government shutdown are among the reasons for the sluggish growth. The good news is that this is consistent with previous first quarter readings this cycle, and some temporary headwinds are expected to clear, setting up a pickup in growth in the second quarter. In addition, the consumer spending outlook remains solid, buoyed by continued gains in employment and wages. 	Stalling capital investment. Disappointing capital investment in recent quarters is partly due to ongoing trade uncertainty and weaker business confidence. The weaker business investment environment is evidenced by the dip in manufacturing surveys from the Institute for Supply Management since last fall. Moreover, in large part due to trade uncertainty, the fiscal stimulus put in place as part of tax reform in 2017 has not driven quite as much capital spending as we anticipated. We still expect an eventual U.S.-China trade deal to help shore up business confidence and lead to more investment as U.S. businesses take advantage of improved incentives for investment, including immediate expensing. 	Slower earnings growth. Though S&P 500 earnings estimates tend to come down over the course of a calendar year, the recent drop is greater than the historical average. Consensus now expects a 4% increase in S&P 500 earnings in 2019, with the possibility of a slight decline in the first quarter, according to FactSet. At this point, we’re maintaining our 2019 earnings per share(EPS) estimate of $172.50 for the S&P 500 Index, representing about 6% growth. When we initiated this forecast, our number was 3 percentage points below Wall Street consensus. Over the past several months, consensus estimates have fallen to 2.5 percentage points below our estimate, which we believe may be overly pessimistic. Solid economic growth and clarity on trade may result in earnings closer to our number. We believe a more cautious stance on equities may also be warranted based on technical analysis. 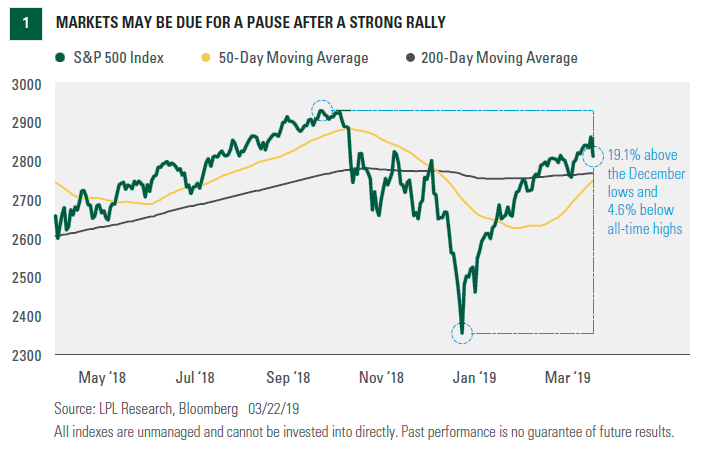 Given the significant run-up in prices over the past few months, along with likely weakness in first quarter GDP and corporate profits, a consolidation of these gains may be in the cards before we potentially move back to the all-time highs. Weakness in some industrial metals and transports, which have some market forecasting capability, is noteworthy. On any potential pullback, we would look for the 50- and 200-day moving averages to act as support in the 2,725 to 2,750 range. Importantly, we do not expect a retest of the December 2018 lows given fundamental and technical support. The bond market is also sending cautious signals with the sharp move lower in yields, the latest leg down coming after last week’s Federal Reserve meeting, which indicated the likelihood of no more interest rate hikes in 2019. The latest drop in the 10-year yield brings the U.S. Treasury yield curve teetering on the edge of inversion (when long-term yields fall below short-term yields). That worrisome signal has preceded each of the past nine recessions going back to 1955. 	Increased costs could weigh on companies’ profit margins and hurt profits. 	U.S.-China trade negotiations could be prolonged and pressure market sentiment. 	The global economy may slow more than expected. 	Signals of weaker growth from the bond market may prove to be correct. 	Structural challenges in Europe (Brexit and Italian debt) and Japan (upcoming consumption tax) may be bigger drags on growth than the market expects. **Thank you to Ryan Detrick and Scott Brown for their contributions to this report.